uphea llavea is a bushy to mounding perennial subshrub that is native to Mexico. This perennial will flower from spring till fall and is a great attractor of hummingbirds to the garden. Bat Face Cuphea produces masses of 1″ purple tubular flowers. The tubes are lipped with two upward facing pedals. These resemble ears and the purple tips resemble the face of a bat, hence the common name. Cuphea llavea does great in the heat, requires excellent drainage, and is also drought tolerant. This perennial is frost hardy in the upper 20’s and root hardy in the lower 20’s. 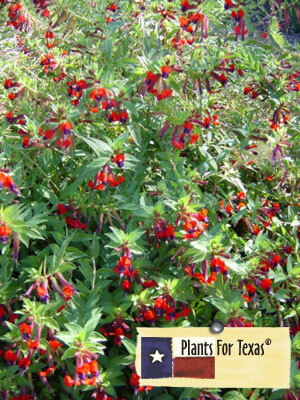 Cuphea llavea is part of our Plants For Texas® Program, meaning it was Texas Grown, Tested in Texas to perform outstanding for Texas Gardens.